Starch is the extract we use in making Starch Fufu that goes well with Banga Soup. It is used as the binder in Spring Rolls Wrappers dough. It is also used to make clothes stand at attention LOL. That reminds of those days that people added so much starch to their clothes especially linen. Chai! You will often see starch sold side by side with Akamu/Ogi in Nigerian markets. On this page, I'll explain how you can make it if you cannot buy it where you live. Chiffon cloth: for separating the wet cassava starch from the chaff. Blender: Any blender with at least 500W power will do. Any tightly woven cotton, calico or canvass bag whose weaves do not shift is great for this. You can make yours at home using the materials mentioned above if you have a sewing machine and know how to sew. In Nigeria, salt used to come in muslin bags, if you still have such bags, it is perfect for this. You need to wash it well before use to remove the salt. Brand new cotton pillow cases also make great muslin bags. The quantity of cassava tubers you need depends on the quantity of starch you want to make. Starch stores well in the freezer so you can make large quantities and store. You need water to rinse, blend and sieve the starch. It is much better to watch the process than read about it so watch the video below for details. Peel the cassava tubers following the natural peel lines. Blend in the blender using as little water as possible. Separate the chaff from the cassava blend using the chiffon cloth. Rinse with clean water till all the starch has been washed off the chaff. Leave the starch in the bowl for at least 3 hours so that the starch will settle at the bottom of the bowl. When settled, clear water will be seen at the top while the starch will be at the bottom of the bowl. Decant the clear water and pour the watery starch into the muslin bag. Tie up the muslin bag and leave on the sink tray for the remaining water to drain. This may take overnight to happen. When the starch is all solid, it is ready to be used. Store in the freezer for up to 2 months. 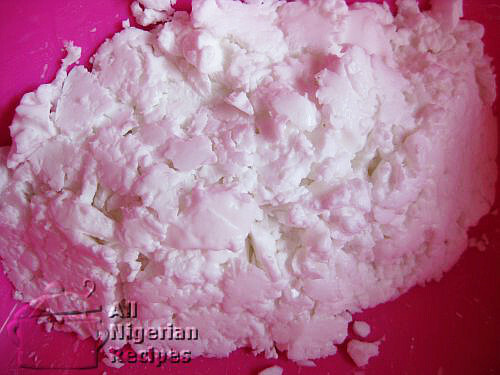 Use starch to make Starch Fufu and as a binder for Spring Rolls Wrappers dough.